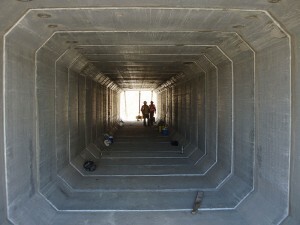 Necessary for many large-scale construction projects, precast concrete vault structures are the ideal solution. Have a challenging job site, tight installation window, or uncooperative weather? Columbia Precast Products delivers the pieces you need to get the job done on time. There are a variety of standard shapes that can be provided, including round, square, or rectangular. Custom shapes are also available and meet the most severe loading requirements. Our custom precast concrete vaults are manufactured in a controlled environment utilizing the latest quality control techniques. This gives you the quality assurance you deserve prior to arriving on the job site. Precast concrete water vaults house potable water products, such as valves, backflow devices, and water meters. Columbia Precast Products’ concrete vaults will provide a safe, watertight environment for the monitoring and maintenance of your water system. Safety accessories, such as access ladders and hatches, safety nets, and ladder-up safety posts are available as well. Some typical applications include wet wells, water meters, valve chambers, and backflow preventers. Precast concrete vaults are the ideal product for use in the non-potable water treatment process as well. We offer a variety of sizes and capacities that can serve a wide range of treatment processes. From simple oil/water separators and septic tanks to more complex filter units. Another positive feature when using a precast concrete unit is that there is easy access for maintenance. Precast concrete vaults are engineered to meet the most severe loading requirements and job site conditions. Oil/water separators: An oil/water separator prevents oil in stormwater runoff from reaching the local water and sewage systems. It’s integrated into a larger water treatment system and offers protection from surface water pollution. A precast separator will improve the process by enhancing the coalescing and gravitational separation. This also reduces the otherwise frequent need for maintenance and cleaning. Grease interceptors: These ensure fats, oils, and grease are kept from the wastewater as it leaves a restaurant or commercial kitchen. These are often required by city municipalities. Coalescing plate separators: Certain sites require specific oil removal design, such as gas stations, automotive shops, and industrial loading facilities. We recommend installing coalescing plate separators, which efficiently remove large amounts of oil in a body of water. Media filter processes: These typically involve a large vault that’s used in stormwater treatment. Instead of multiple filtration units, these filters are cost-effective and often needed to ensure compliance with state and federal regulations. Construction usually involves built-in or cast-in frames, adjustable weirs and other methods to ensure high-quality control. Fuel spill/containment processes: We offer multi-component containment structures with primary and secondary tanks as well as engineered outer vaults. This provides storage solutions that are impact resistant and promised to last. These are best used for fuel dispensing, oil storage and generator applications. Septic tanks: Used when access to municipal sewer systems is unavailable or as part of a larger onsite wastewater treatment process. Septic tanks are designed to be outfitted with biofilters, allow materials to decompose, and hold sludge in place. Treated effluent can be discharged into ground fields or other holding tanks. Assured high strength and durability of concrete vaults with stringent factor quality controls. We are able to strength-test our pieces before they ever reach you. Working on an unusual or difficult project? Our custom engineered designs offer flexibility without sacrificing durability. Our vaults are ready when you are, providing speedy and contractor friendly installations. This reduces exposure to prolonged open excavations, reducing labor costs and increasing safety. Water-tight pipe penetrations, custom coatings or linings, steps or ladders, vents, and many more options are available with our vaults. Columbia Precast manufactures standard, customizable, and durable vault products for any number of applications. With an experienced crew working in a controlled environment, our reputation for quality is well-earned. We are the premier precast concrete vault provider in the Pacific Northwest. Have a large infrastructure job on the horizon requiring water, containment, or treatment vaults? Contact Columbia Precast Products today to see how we can help. We look forward to working with you and providing products that will stand the test of time.